The minute I saw Red Sky, I knew he was The One. He was a living sculpture as he stood on the front lawn -- long legs, muscular hips, and a black and tan striped coat called “brindle.” His only motion was the curling of one leaf-shaped ear as I approached. “Oh, he’d love that,” said Susan with a smile. She knew this elegant dog pretty well. He had stayed with her for two weeks after the dog adoption organization rescued him from track life. That summer day, my husband, our medium sized mutt, Gertie, and I came to claim this greyhound and give him a permanent home. I ran my fingers down Red Sky’s neck. His fur was so soft! Then I stooped to kiss his long snout. Gertie licked him on the mouth and got into play position with a wagging tail. “Looks like he’s The One, all right,” my husband said, kneeling on the grass to look into the dog’s almond-shaped eyes. Throughout the years, we’ve rescued one cat and two dogs without knowing the history of their young lives. Adopting this greyhound was especially exciting because we knew that Red Sky was two and a half years old, and had raced for probably a year or more. We also guessed that he had some bad days at the track, and we wanted to make it up to him. The tattoos in his ears told us his racing number as well as the month and year of his birth. Did it hurt, I wondered, when those blue markings were branded into his sensitive flesh? 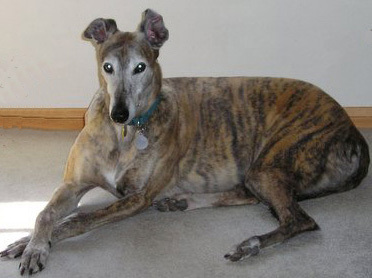 The greyhound existed thousands of years ago in ancient Egypt. Only royalty owned this breed and the graceful speedster was invited in as a member of the family. After the greyhound died, it was commonly buried in the tomb of its master – usually a Pharaoh - who treated his pet almost as lovingly as he treated his own son. Things certainly changed after the greyhound finally got to America. Why? Mainly because this canine is the fastest dog in the world, with the ability to run over forty miles an hour! By comparison, the fastest human runner goes at about twenty miles an hour. Even though the greyhound’s gift of speed was greatly admired in ancient Egypt, it brought this dog a world of worry in America starting in the 1920’s when greyhound racing became popular and track life troubles began. What is track life really like for greyhounds? Well, from the age of 12 months old, pups are trained to run fast and chase a moving object called a “lure.” They are then moved from their breeding “farm,” where they romp and play, into a racing kennel, where they live out their career in crates that are frequently too small for the sixty to eighty pound dogs. They are “turned out” of these crates about four times each day to potty and play. The dogs have to wear muzzles so they don’t injure each other while frolicking. They also wear muzzles when they run an actual race. Many owners never even see the racing dogs they own. They simply use them to earn money. Owners, who are not involved with their racers, sell and trade them as if they’re toys without realizing these super athletes are living creatures with needs and feelings. Unlike the owners, the trainers have the most contact with the greyhounds. They train them, pet them, and decide which races the dogs will enter. To get a glimpse of the business side of the track, let’s say a particular dog earns $2000 by winning races; that means all the humans involved win too. The owner of the racing kennel will get 60% or $1200. The dog’s owner gets %35 or $700 and the trainer gets a measly 5% which equals $100! As you can guess, the trainers probably treat the dogs pretty well because they want good performances out of them on racing day. 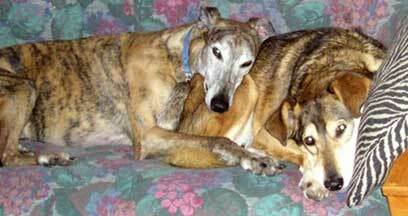 Greyhounds that don’t win races are “retired.” Adoption groups across America rescue these dogs and find wonderful loving homes for them. On the darker side, there are depressing stories about retired racers that are abandoned or killed, simply because they no longer run fast enough to make racetrack fortunes grow. One such story tells of greyhounds from the Arizona track that were dropped off in the desert to eventually die of thirst and starvation. These unlucky dogs were simply too slow, too timid, or too injured to continue racing. Cheetah and Gertie, sharing the couch and a quiet moment. Ah! But, let’s get back to Red Sky – we adopted him immediately! We knew we’d have to change his name. Red Sky, although very poetic, was related to his track troubles. His new life was going to be trouble-free. So, that first day we took him to a soccer field that was completely enclosed by a chain-link fence and . . . we let him GO! His long body stretched into a sprint. His head bobbed as he picked up speed. His paws barely touched the ground. Three young boys were watching, and their mouths hung open. “He looks like a cheetah,” the tallest boy said. “Yes, he sure does,” I looked at my husband. And that was it for us. Cheetah was Red Sky’s new name. in a crate and ran around dirt tracks most of his life. His paws just couldn’t get a grip on the smooth wood. We also had to train him to respect tiny dogs. To a greyhound, a very small animal can be mistaken for a lure, or even a live rabbit, especially when the pint-sized creature begins to run! With love and bushels of patience, though, Cheetah has blossomed. These days, he prances with happiness, much like a pony, and both dogs cuddle daily on the futon in our guest room. But the best treat of all is watching Cheetah’s twice a day run on the soccer field with little Gertie quite far behind. Without a muzzle, his open mouth appears to be smiling. I’m thrilled and can’t help laughing when he doubles back, races full speed toward me, and comes to a graceful stop so I can give him a big hug. Finished with his fun run, Cheetah walks beside me, a friend for life. I whistle for Gertie and we wait together until she appears, running towards us, sweet and eager, definitely qualifying for a greyhound in training. Online at www.greytexpectations.org info/manual/man.html – A Greyt Experience – Manual. Section 2, “Track Life."